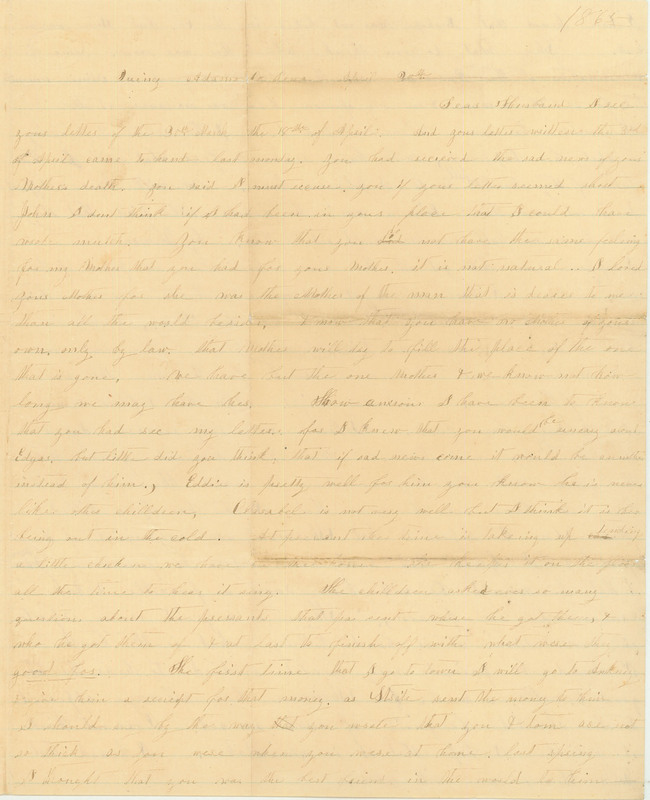 Quincy Adams Co Iowa April 30th 1865 Dear Husband, I see your letter of the 30th March, the 18th April, And your letter written the 3rd of April came to hand last monday. you had recieved the sad news of your mother's death, you said I must excuse you if your letter seemed short. John, I don't think if I had been in your place that I could have wrote mutch. You know that you do not have the same feeling for my mother that you had for your mother, it is not natural. I loved your mother for she was the Mother of the man that is dear to me than all the world besides, & now that you have no Mother of your own, only by law, that mother will try to fill the place of the one that is gome, we have but the one mother & we know not how long we may have her. How anxious I have been to know that you had see my letters, for I knew that you would be uneasy about Edgar, but little did you think, that if sad news came it would be another instead of him. Eddie is pretty well for him. you know, he is never like the other chilldren, Clarabel is not very well but I think it is her being out in the cold. At present her time is takeing up tending a little chick we have in the house, she keeps it on the floor all the time to hear it sing. The chilldren ask ever so many questions about the presants that you sent, "where he got them, & who he got them of & last to finish off with, "what were they good for?" The first time that I go to town I will go to Ankeny & give him a reciept for that money as [Strite] sent the money to him. I should say, by the way, you wrote that you & Tom are not so thick as you were when you were at home last spring. I thought that you was the best friend in the world to him.